On 30 November 2018 a contract was signed between the PGZ Consortium and the Armament Inspectorate of the Polish MoD to deliver 12 Tactical Short-Range Orlik Unmanned Aerial Vehicle Systems. Members of the consortium include PGZ S.A., WZL nr 2 and PIT-RADWAR and the system they offered to the Polish Armed Forces, PGZ-19R, has been entirely designed and manufactured in Poland. “Unmanned aerial vehicles commonly referred to as drones play an increasingly important role in today's battlefield. The world's leading armament companies have developed their competences in this field. Today we can proudly announce that PGZ joins this group, offering fully modern solutions to be used by the Polish Armed Forces,” said Sebastian Chwałek, Deputy President of PGZ S.A. said after signing the contract. The signing of the agreement is the result of PGZ's decision in 2016 to build competence in the field of design and production of UAVs. It was then that the Competence Centre for UAV systems was established in WZL nr 2 S.A. in Bydgoszcz. 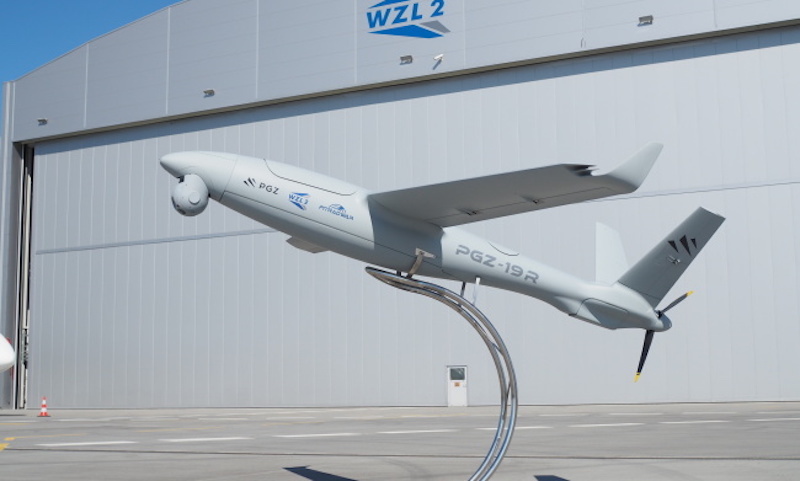 The Centre carries out work on innovative UAV systems at the PGZ Capital Group level. The result is the first fully Polish tactical short-range UAV. Under the "Orlik" programme, the PGZ consortium offered to the Polish Armed Forces the PGZ-19R system, designed from scratch and manufactured in Poland. It is a system for long-term imaging over a wide area, in various field, climatic, day and night conditions. -- Initial logistics and training packages. -- optional (4 sets), to be executed in 2023-2026. The main elements of the system offered by PGZ are: diesel or hybrid unmanned aircrafts and a ground control station. The element integrating these two components is a communication and data transmission system based on a ground data terminal. The ground control station allows the operator to control the UAVs remotely and to manage the payload (e.g. camera and sensor control). The PGZ-19R system has been designed to be completely independent from ground infrastructure (airports). The system is highly mobile. The ground control station and logistics vehicle were constructed basing on 15-foot containers placed on high mobility vehicles. The ground data terminal and the pneumatic launcher are built on trailers pulled by these cars. The mobile configuration of the set enables its transport by land, sea or air. The BSP has a maximum take-off weight of 90 kg and a load capacity of 20 kg. The payload is an optoelectronic head consisting of a day camera, an infrared camera, a laser rangefinder and a laser target pointer. In addition, the PGZ-19R is equipped with a very high-resolution slot SAR radar. An unmanned aerial vehicle can stay in the air for up to 12 hours at an altitude of up to 5000 metres. Landing takes place in a classic way or with the help of a parachute. In addition to PGZ 19-R, Polska Grupa Zbrojeniowa has solutions for miniature unmanned aerial vehicles, for example: NeoX with a take-off weight of up to 11 kg and communication range of up to 30 km, as well as an even smaller AtraX family of autogyros, which in addition to military applications can also be useful for civilian users. Polska Grupa Zbrojeniowa is considering submitting to the Ministry of National Defence a concept for the development and production of a system of mid-range unmanned aerial vehicles under the "Gryf" programme. At the same time, research and development works in the field of light UAV for uniformed services and the civil market are being continued.